This Thursday, Amazon(s amzn) enters the crowded but still growing smartphone market: Pre-orders for the Amazon Fire Phone will arrive on July 24 and the phone will become generally available. When introducing the Fire Phone, Amazon highlighted the phone’s unique Dynamic Perspective — 3D effects that work in tandem with four camera sensors — and its Firefly service, which uses the phone’s camera and Amazon’s vast product database to identify physical items. Is the phone a worthy competitor to what’s already available on the market? I spent the last few days using the Fire Phone to answer that question, although some of my time with the product was taken away by my wife: She’s already sold on the device. What is the Fire Phone? If you’ve seen one rectangular slab of a phone, you’ve seen ’em all. Having said that, the Fire Phone has an appealing design: Corning(s glw) Gorilla Glass 3 on the front and back with a rubberized, curved edge around the sides. The phone uses a 720p 4.7-inch LCD display; that’s a lower resolution than similarly priced phones but in my usage, I found the screen looked crisp and very bright from every angle. A 2.2GHz Snapdragon(s com) 800 powers the device, along with 2 GB of memory. The phone runs Amazon’s version of the Android Open Source Project software — Fire OS 3.5 — similar to Amazon’s Kindle Fire tablets. For now, the Fire Phone only works with AT&T’s(s t) network in the U.S. for voice and LTE data. It has fast 802.11ac Wi-Fi, GPS, a Bluetooth 3.0 radio and supports NFC. Depending on the model you choose, the phone comes with either 32 or 64 GB of internal storage. There is no memory card expansion slot and the sealed 2400 mAh battery can’t be replaced. A single home button adorns the front side of the phone: Tap it once to go home; tap it twice to switch between running apps. There are four camera sensors — one in each corner — on the phone’s front; more on what those are for in a bit. Additionally, there’s a front-facing 2.1 megapixel camera. The backside of the phone is all glass save for the 13 megapixel camera sensor with five element lens and f/2.0 aperture, a microphone and LED flash. The power/wake button sits along the top left of the phone as does one speaker and a headphone jack. The left side has volume up / down buttons and another button that serves a dual purpose: Tap it for opening the camera app (or for snapping a pic) or hold it to launch Firefly. 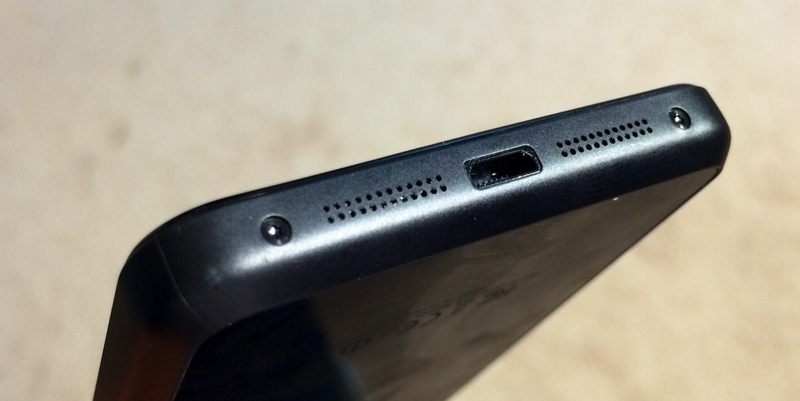 The bottom of the Fire Phone has another speaker and a microUSB port for charging the device. When watching video in landscape mode, the speakers serve as left and right sound sources with Dolby Digital Plus audio processing. 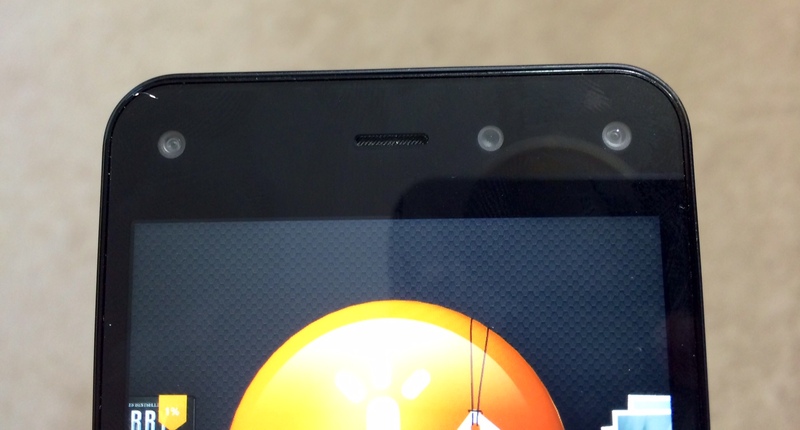 If you’ve used a Kindle Fire tablet, you generally know what to expect from the Fire Phone. In fact, my wife described the handset by saying, “It’s just like my Kindle Fire HDX but it makes phone calls and I can take it everywhere.” That sentiment explains a bit about the target audience for the Fire Phone: People who already like and/or use Amazon’s software and services. But that doesn’t mean the phone is “less capable” than the competition. I used the handset just like I would my iPhone 5s or Moto X phones and didn’t run into any major limitations and the performance is solid. It’s pretty easy to get around on the phone too. 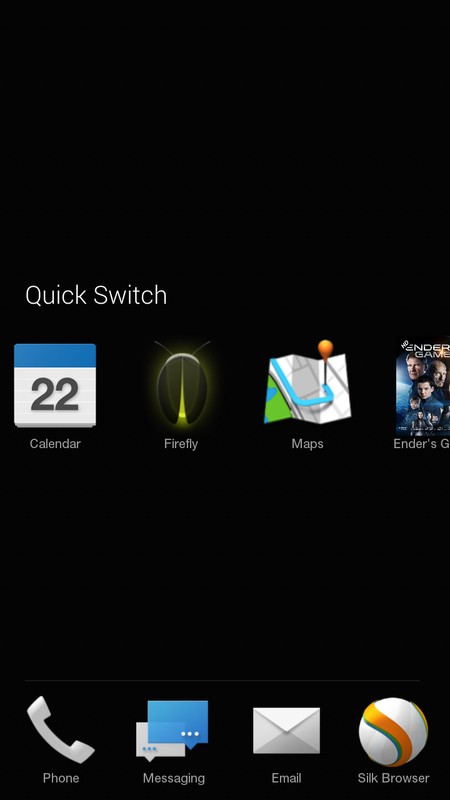 The overall user interface is reminiscent of that on the Kindle Fire — complete with a carousel of recently used apps and information about them — but with tweaks that are well suited for a smaller screen. It’s easy to see and switch between running apps with a double-tap of the home button, for example. And if you want to close apps, you can do so with that same action: Just swipe up on a running app and it disappears. Aside from the carousel on the home screen, there are four app shortcuts on a bottom dock. By default, there are Phone, Messaging, Email and the Silk Browser. To see all of your installed apps, simply swipe up from the dock. You can replace any of the four apps by dragging an app to the dock and you can also create folders called “App collections” that hold multiple apps. Overall, it’s a pretty simple (and by now familiar) way to manage apps. Notifications and settings will also look familiar: Swipe down from the top of the screen for 8 setting shortcuts and any notifications. I had no issues using my Gmail account with the Email app and was happy to see my multiple Gmail calendars in the Calendar app. The swipe-style keyboard works well. The Silk Browser works just like it does on Amazon’s tablets; I do wish it had a feature similar to Safari’s Reader that strips everything out but content. Of course, you can always install another browser on the phone, or any non-Amazon apps: The Amazon AppStore has a few hundred thousand software titles to choose from, including most of what I’d call “top-tier” or common apps such as Facebook(s fb), Twitter, Instagram, Netflix(s nflx), etc. and you can side-load Android apps. Watching videos from Amazon Instant Video on the 720p screen was better than I expected; the same videos didn’t look quite as good on my Moto X, which also has a 4.7-inch 720p display. Videos also get the “X-Ray” feature with useful data on actors from IMDB. The camera software and output is quite good, particularly in low light. There’s an HDR function, a way to take panoramic pics and also a lenticular lens, which allows you to capture up to 11 images of a single subject to create a 3D-like experience when tilting the phone. The handset also captures 1080p video capably. Best of all, Amazon will automatically back up every photo you take in your Amazon Cloud Drive. There’s no cost and no limit: You could theoretically store a million photos there at no charge. I didn’t use the phone enough to test battery life but Amazon said to expect 22 hours of talk time or 11 hours of video playback. Calls on the handset sounded clear on AT&T’s network. Occasionally, the phone’s back felt warm on back, particularly when I was pushing it with several CPU-intensive apps. Dynamic Perspective. This is how Amazon describes the 3D effects enabled by those four camera sensors, the phone’s internal gyroscope and accelerometer. It’s immediately evident on the phone’s lock screen, which lets you see “around” objects and images either when you tilt the phone or move your head around it. Firefly. This app, which can be launched via an icon or a long-press of the camera button, is used to recognized physical objects, music and television shows. It can also scan bar codes or read text, such as contact information, phone numbers, email address and URLs. Amazon Prime. It wouldn’t be an Amazon phone if it didn’t have deep hooks into Amazon’s Prime membership, which is free for one year with the phone purchase. Mayday. This is the one-touch helpdesk app Amazon uses to provide support for the phone. Make a Mayday call and you’ll have a video chat with an Amazon support specialist who can guide you to help or even take control of your phone and show you how to do things with it. One-handed gestures. These take advantage of both the internal phone sensors and the four cameras on the front of the phone. You can flick the left side of the phone up for example to see useful contextual in-app menus. Flick up the right side for other information. Tilt the phone forward and you can scroll down a web page; tilt back to scroll up. 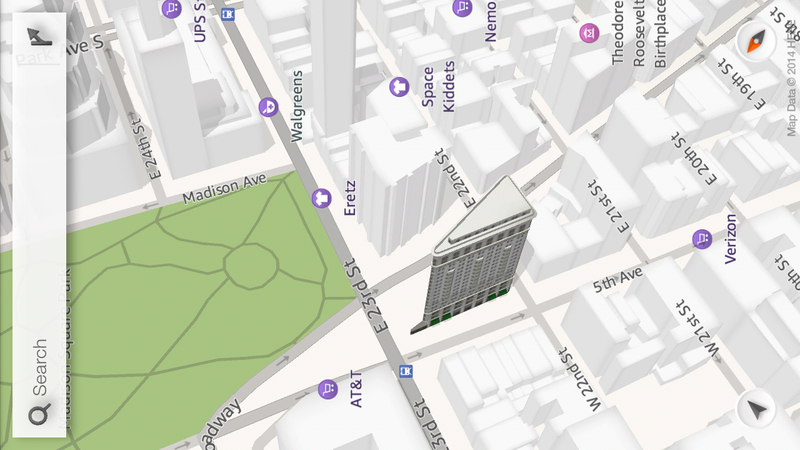 And at any time tilt the phone slightly left or right to “peek” at additional layers of data, such as on a map. Are these must-have features or just something different? Overall, these features are much of what makes the Fire Phone different from other handsets, although some phone makers have implemented similar functions in the past. Samsung’s Galaxy S phones introduced a tilt to scroll feature well over a year ago. I think Amazon implemented a better one though and it has to do with those extra cameras. I spoke about that with Ian Freed, vice president for Fire Phone at Amazon, and he told me the cameras add an additional data source that makes the gestures and scrolling better than by a gyroscope alone. I can see his point; I feel the Fire Phone offers better control for up, down, left and right actions. Dynamic Perspective in general, though, seems a little gimmicky. Do you really need to see all of the icons in your carousel or launcher move around in 3D when you tilt the phone? The real benefit comes into play when apps take advantage of the camera data. Amazon’s Maps is a good example, letting you get at Yelp reviews for a restaurant search with a simple tilt or see a 3D overhead view. I also played a 3D puzzle game where this came in handy. But the amount of apps optimized for Dynamic Perspective is few; watch to see if developers jump on board and support it. Power users, not likely. But a mainstream Amazon Prime customer? Certainly. I’ve used Android phones since 2008 and the iPhone for a year longer. I’ve also flashed dozens of custom ROMs on my phones and tinkered away for weeks trying to get my handsets to do all sorts of things. As a result — and this won’t likely surprise you — I’m not in the market for a Fire Phone. I’m generally impressed by Amazon’s first effort here but I need more than the phone offers. My wife is the perfect candidate, however. She’s always owned an iPhone but generally uses it for the basics: Email, phone calls, messaging, Facebook, photos, ebooks, videos and some light gaming. 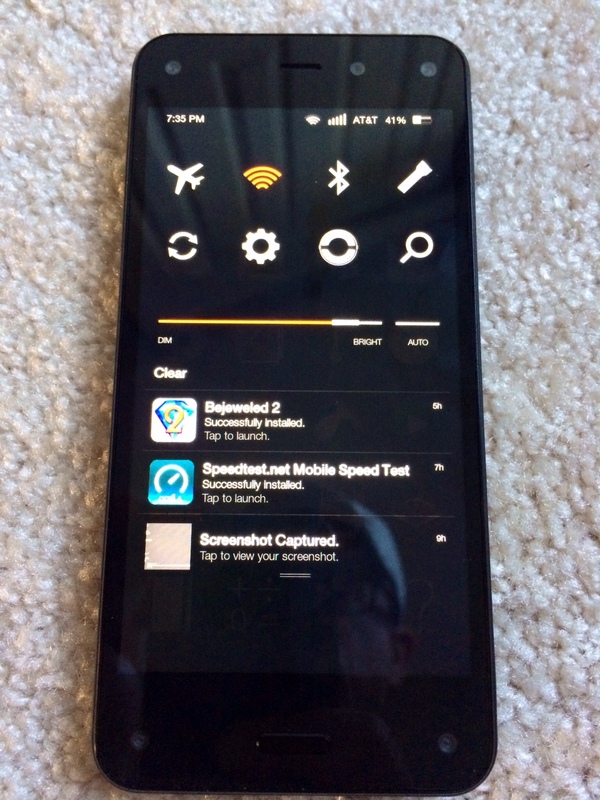 Amazon’s Fire Phone can easily do all that and do it well. We’re Amazon Prime members already — Amazon will credit us a free year at our next renewal if my wife buys a Fire Phone — and we watch a fair share of Amazon Instant Video. And yes, we “showroom” when we’re out shopping: Checking the retail prices of what’s on the shelf and comparing to Amazon. As a result, even with the limited AT&T exclusivity, there’s clearly a market for Amazon’s Fire Phone. Even for those who are already using an iOS or Android device. Is that market huge? By comparison to Apple’s iPhone, I don’t think so. But it likely doesn’t matter to Amazon: It will keep plugging away and putting an Amazon shopping terminal in as many hands as it can. If one of those hands are yours, expect to pay $649 for a 32 GB model without contract or $100 more to get a 64 GB version. Customers can also opt to buy a Fire Phone on AT&T’s Next programs. Both are $0 down with monthly payments of $32.50 for Next 12 or $27.09 with Next 18 for the 32 GB model. Those monthly prices rise to $31.25 and $37.50 for the 64 GB version. Amazon notes that its base phone comes with double the internal storage of most other handsets. That, along with the free year of Prime valued at $99 and the unlimited photo storage add up to a reasonable price for what Amazon has delivered. I find the FireFly features to read printed text like phone numbers and website addresses is useful. Â I did this recently on vacation using a free App for iPhone (VisuCaller). 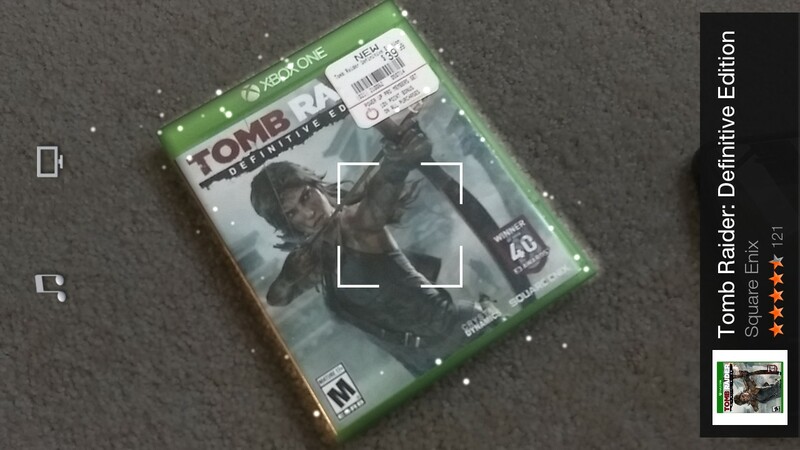 Â Scanning objects just to buy from Amazon does not interest me as much. HOLD UP. 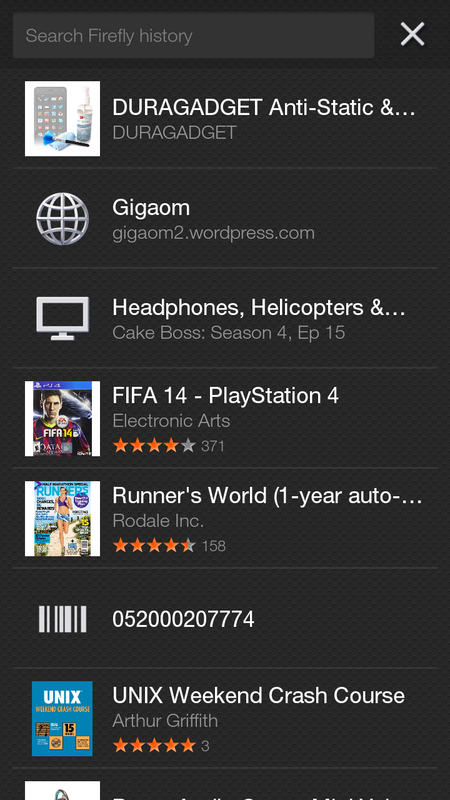 You watch your Amazon Instant Video on your Moto X??? ?